Apply NFPA 484 for the most advanced fire and explosion safety around all types of combustible metals and metal dusts. Completely reorganized to align with NFPA 652, Standard on the Fundamentals of Combustible Dust, NFPA 484, Standard for Combustible Metals presents widely accepted safety requirements for any metal that meets the definition of a combustible metal in NFPA 484 -- including alkali metals, aluminum, hafnium, magnesium, niobium, tantalum, titanium, and zirconium. NFPA 484 addresses the production, processing, finishing, handling, storage, use, and recycling of all metals and alloys that are in a form capable of combustion or explosion. Make sure you understand and follow proper dust capture or collection, housekeeping, and identification of potential ignition sources. NFPA 484 was developed in response to fires where fire suppression water was used inappropriately, often with disastrous results. The reorganized 2019 edition has added material in Chapter 1 that clarifies the application of the standard to mixtures of metals and other combustible nonmetal dusts, and updated definitions in Chapter 3 that correlate with NFPA 652. It’s important to understand that fire and explosion hazards are potentially present from operations involving production, processing, finishing, handling, recycling, storage, and use of all metals and alloys that are in a form that is capable of combustion or explosion. In addition, operations where metal or metal alloys are subjected to processing or finishing operations can produce combustible powder or dust are covered by this standard. New Chapter 4, General, includes material on objectives and compliance options, Management of Change, and PPE. New Chapter 7 addresses Dust Hazard Analysis. Updated Chapter 8 strengthens the provisions regarding static electricity. Revised requirements for electrical area classification spell out differences with NFPA 70®, National Electrical Code®, and that the NEC® zone classification system is not to be used for metal dusts. Chapter 11, Powder and Dust Collection and Centralized Vacuum Systems, provides greater clarity on a complex topic. New Chapter 12, Nanometals, and new Chapter 13, Additive Manufacturing, reflect emerging technologies and issues in the metals industry. Chapter 15, Legacy Metals, consolidates the common requirements for aluminum, magnesium, niobium, tantalum, titanium, zirconium, and hafnium into a single location. Material that is specific to one of these metals remains in the metal-specific chapters. Interested in other editions of NFPA 484? Use the drop down menu above to select the edition year you need. 4.6 Personal Protective Equipment (PPE). 4.7 Dust Explosion and Flash-Fire Hazard Areas. 4.8 Segregation, Separation, or Detachment to Limit Dust Hazard Areas. 5.5 Use of Test Data for Hazard Analysis. 6.5 Evaluation of Proposed Design. 7.2 Dust Hazard Analysis (DHA). 7.3 Molten Metal Hazard Analysis. 9.4 Cleanup Procedures for Fugitive Dust Accumulations. 9.5 Cleanup of Spilled Dust, Fine or Powder. 9.7 Compressed Air Cleaning Requirements. 10.6 Control of Friction Hazards. 10.7 Electrical Power and Control. 11.3 Centralized Vacuum Cleaning System. 11.5 Pneumatic Conveying of Powder. 12.4 Equipment Design and Operation. 13.3 Additive Manufacturing Equipment and Operations. 13.4 Equipment and Object Cleaning. 14.7 Machining, Fabrication, Finishing, and Media Blasting. 14.9 Fire and Explosion Protection. 15.5 End Users of Powder. 15.7 Machining, Fabrication, Finishing and Media Blasting. 15.9 Fire and Explosion Prevention. 16.5 End Users of Powder. 16.7 Machining, Fabrication, Finishing, and Media Blasting. 16.9 Fire and Explosion Prevention. 17.2 Recycling and Waste Management of Combustible Metal — Collection, Storage, and Handling of Fines Generated During Scrap Receiving, Storage, Recycling, and Waste Treatment. 17.3 Storage of Combustible Metals for Recycling and Waste Management. 17.4 Sample Identification and Collection for Metals in a Combustible Form. 17.5 Personal Protective Equipment (PPE). 17.11 Fire and Explosion Prevention. Look to NFPA 484 for advanced fire and explosion safety around all types of combustible metals and metal dusts. Reflecting the latest research, testing, and fire experience, the 2015 edition of NFPA 484, Standard for Combustible Metals presents widely accepted safety requirements for any metal that meets the definition of a combustible metal in NFPA 484 -- including alkali metals, aluminum, hafnium, magnesium, niobium, tantalum, titanium, and zirconium. 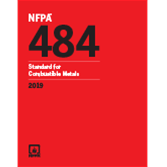 NFPA 484 addresses the production, processing, finishing, handling, storage, use and recycling of all metals and alloys that are in a form capable of combustion or explosion. Make sure you know about proper dust capture or collection, housekeeping, and identification of potential ignition sources. Compliance with the latest edition of NFPA 484 is critical, as fire and explosion hazards are potentially present from operations involving production, processing, finishing, handling, recycling, storage, and use of all metals and alloys that are in a form that is capable of combustion or explosion. In addition, operations where metal or metal alloys are subjected to processing or finishing operations can produce combustible powder or dust are covered by this Standard. Common requirements for all metal types -- such as PPE, management of change, dust collection, ignition sources, and hazard analysis -- formerly in Chapters 11 through 18 -- have been moved into fundamental Chapters 4 through 9. Chapter 4 has revised procedures concerning material characterization and determining combustibility and explosibility for metal dusts. Use of either test data or historical data is now permitted. Chapter 5 has new requirements for management systems elements, such as management of change, hazard analysis, and PPE. Chapter 7 establishes a threshold for fugitive dust accumulations, which is then used to trigger specific requirements related to dust hazard control. Renamed Chapter 8: Ignition Sources addresses the control of ignition sources such as hot work, smoking, spark-resistant tools, static electricity and friction hazards. It also still addresses electrical area classification. Developed in response to fires where fire suppression water was used inappropriately, NFPA 484 is critical to fire safety.